3:32 PM Just a quick update to let everyone know that we're doing fine. Sorry if our lack of posting has lead to any worrying on your part--there's not been a whole lot to post, especially after our post-Disney "let-down" and the holidays. We've all been doing well. Sophie, Susan, and Elisabeth seemed to get over whatever upper respiratory thing they had going on, but here lately, there has been another round of sniffles and coughing. Hopefully it won't lead to much for anyone. Sophie has been doing great. She went in for her monthly treatment yesterday (I took her) and that went about as can be expected anymore. She was not at all happy about being stuck (took two tries this time, poor thing), but once all was said and done, she was a happy camper. Our Carolina Pal, Adrienne, visited for a while before class, so that was nice. Turns out she's going to study abroad next semester in Barcelona, so we might not get to see her again, although she promised to write post cards, which Sophie will love, I'm sure. Sophie still complains of headaches and tummy aches every now and then, but the doctors don't seem too concerned by them. She got a spinal tap yesterday, so if there had been any sign of relapse there, they would have caught it. We got to have a conversation about what the end of treatment would be like. Very exciting just to think about. Somebody said, "I wonder who's going to be more excited, Sophie, or her parents." No doubt about it, we'll be far, far more excited than she will be. I don't think she's had to mentally or emotionally deal with all that she's been through quite the way we have. Basically, the plan is that we'll finish up near the end of May. Sophie goes in for a final treatment sometime in late May, and we'll continue the course of home medicines until we reach the target date (May 31st, I think). On that day, we get to throw all her meds down the toilet, I guess, except for her Septra (an antibiotic that she's been on since Day One). She'll take Septra for three more months, and then that'll be it---but no more chemotherapy. Two weeks after the end of treatment, she'll get another spinal tap and a bone marrow check to make sure that there are no leukemia cells in either location, and she'll be cleared. After that, monthly blood draws for the first year, with consults with a Pediatric Oncologist. It sounds as if she'll be following up for the rest of her life, but we're thankful that she will have to keep all those annoying appointments. Over Thanksgiving, we had a good visit with my mom. The girls always enjoy her visits, and we all got to go see the Nutcracker the Sunday after Thanksgiving. It was the first time for all of us to go. Susan and Elisabeth went last year and we won't talk about our failed efforts to go to the Nutcracker in previous years--those of you who know will appreciate how long it has taken for us all to see the show! Speaking of shows, we got an unexpected call from Make-A-Wish over the weekend. They are inviting us to the Disney Princesses on Ice show in Raleigh. Sounds like the girls are going to get to meet the performers and even may be part of the show (not just our kids, but other children as well). I'll be sure to take our camera, and I promise to upload some photos (and photos from our Disney trip as well--it's on my to-do list). We'll report back either later tonight or sometime tomorrow! 8:00 AM: Last night was simply amazing! It was a Disney Princesses evening of thrills all around! We arrived at the RBC Center (in Raleigh about an hour away from home) at 5:15, where we met three other Make-A-Wish families who had selected Disney trips for their wishes. One of the families (The Faircloths, for those of you from around here) is from right here in Spivey's Corner, and we know them, so it was great to see familiar faces in addition to meeting new folks. The woman who contacted us (her name is Teresa) had taken care of absolutely everything. We were taken to a special banquet room within the facility, where everything was decorated and Disney music was playing. Each girl received a tiara and a Mickey Mouse mug filled with candy (there was also a brother of one of the Wish kids--he got candy but skipped the tiara!). Everyone met Cinderella and Snow White. Each girl got to take pictures with the characters but also had the opportunity to speak with them. Sophie stood there chatting away with Cinderella about her Disney trip for quite a while. Luckily, when Sophie said to her, "I saw you there and we took pictures," Cinderella responded "I remember!" That's one smart Princess. Then a kid-friendly (but quite good) dinner was served--kids at one table and parents at the other. After dinner, each Wish child received a bag full of Disney Princesses on Ice merchandise to share with their siblings. Sophie traded her Tinkerbell doll for someone else's Ariel and carried her around all night long (and all this morning, I might add). The most special treat of the evening was that the kids would be riding in a boat on stage during Ariel's part of the show. The way it had been explained to the families, we had all assumed all of our children would be included, but it turned out that only the Wish kids could participate because the boat only holds 6 kids (and there were 7 girls). In each case, the sibling was the older child (and much more aware of how special the treat was), so there were some very unhappy girls (Elisabeth most of all) when everyone realized what was going to happen. Randall and I knew what to do right away, because Sophie fretted all the way to Raleigh about being in the boat. She asked all kinds of questions about what it was going to be like (I think she thought it was going to be like a scary ride), and it was clear she didn't really want to do it. So, I suggested that if Sophie sat out, the other 6 girls could all be on the boat. Teresa checked and said that would be fine. Problem solved! Then we went to our seats for the show. We were sitting about a third of the way up and could see everything really well. Sophie sat in my lap for the first half of the show and Randall's for the second. Elisabeth abandoned us completely and sat with Amber (who is also in the third grade at her school). The show was just great! I had never been to an ice show before, and I was really impressed. When Sebastian came out, that was the cue to go down to the stage, and before we knew it, the girls were in the boat. We were so excited for Elisabeth and the other kids! I actually had tears in my eyes, watching her. Sophie was excited for Elisabeth too. We asked her if she thought she would be scared if she were down there in the boat, and she said "I'm kind of scared sitting up here!" We definitely made the right decision. By the time the show ended and we were on our way home, it was after 9:00 (so it was after 10:00 when we finally got home). Sophie complained bitterly about not having her blankie (she complained on the way there too). The steroids are definitely affecting her mood this month. The show was great, but I also appreciated the opportunity to talk with the other parents. I don't know the details of what brought them to Make-A-Wish, but we all spent a lot of time talking about our trips (partly because one of the families hasn't gone yet, and we were sharing tips and experiences with them). One of the dads talked about initially feeling guilty about skipping the lines with the guest pass (especially because they were there in the summer and the lines were very long). Some people in the lines give dirty looks, because they don't know the families are with Make-A-Wish. Or even if they do know, they wish they could skip the line too. But when you think about everything our families go through, we really do deserve something special just for a while. As Randall said last night, he would gladly stand at the back of all the lines if we could make Sophie not have cancer. That really puts it into perspective. 5:30 PM: Things are mostly uneventful here. Although Sophie's mood seems to be improving now that she's coming off of the steroids, her appeitite oddities seem to be increasing. She's had a pretty bad cough since this weekend, and she really doesn't seem to feel well. Just when we're convinced we should take her in to the clinic for an exam, she seems to improve. She hasn't coughed as much today, but she does seem tired (she has been napping for the last three hours). We've kept her home from day care so far this week, but I think we'll send her tomorrow (especially since Randall and I both have plans during the day!). I think we may have mentioned that we were car shopping after the untimely demise of our 1996 minivan. After much deliberation, we finally decided on a 2003 Volkswagen Jetta station wagon (Sophie still calls it a minivan). The miles are low, it's reasonably fuel-efficient (better than the minivan at least), and it has some really nice features. It's exciting for us, but two car payments are no fun. Randall has a meeting tonight, so the girls and I plan to go to Fayetteville for some shopping and dinner (if Sophie ever wakes up, that is). We still have some decorating to do around the house (the lights and ornaments aren't on the tree yet), and we still haven't done our Christmas cards (but the labels are printed! ), but things feel mostly under control at a time when they're usually more hectic. 12:25 PM Well, for those of you locally, you know that Sophie had a terrible, terrible cough last weekend. By Sunday, we were convinced that we would be taking her to UNC on Monday. By Monday morning, however, Sophie's cough improved dramatically, so much so that although I kept her home from school, she seemed on the mend. It seemed to me the first time in a long time that Sophie has been able to fight off an infection like that on her own strength. By Wednesday, she was back at school and everything was just fine. Yesterday, however, she complained of an earache and was clearly not feeling well. Susan called UNC and they agreed that since we were dealing with a likely ear infection, we could just take her to Urgent Care locally and get a prescription for antibiotics. Susan spent the better part of the day yesterday doing just that. Later in the afternoon (after the all-day Urgent Care and pharmacy trip), Sophie felt worse and worse and eventually spiked a fever. By about 7pm, we were making plans to take her to UNC. Susan got her to UNC, and the bloodwork came back late last night--Sophie's ANC (the measure of her immune system that we tend to watch carefully) had dropped to 0.3 (they prefer it to be above 1.0). Maybe because of the series of infections, or maybe because the doctors upped Sophie's chemo drugs ever-so-slightly, she's now officially "neutropenic," which means she's highly susceptible to pick up everything and anything. All of that means that Sophie was admitted to UNC late last night and will stay for at least another day. We thought we were through all of this uncertainty, but clearly we are not! Our church has its Christmas Program tonight, so Elisabeth and I are hanging out at home until that's done and then we'll trek up to Chapel Hill. Susan will bring Elisabeth back and I'll spend the night up there. It's not entirely clear what we're looking for as far as Sophie's eventual release date might be, but we know that she'll need to get some stronger counts on her ANC--the next check won't come until tomorrow morning, and, ideally, she'll be fever-free before she gets released as well. She's on IV antibiotics right now with tylenol to keep her comfortable. Unfortunately, there isn't much the doctors can do for Susan, or me, or Elisabeth--we all just have to wait! Please pray for us all. 5:45 PM: Our little Sophie is still in the hospital. Randall was with her last night, and she had more fevers during the night (pretty high ones too). They did a blood draw this morning. Unfortunately, they couldn't get enough blood to come out of her IV site, so they had to draw blood from her other arm, and it took three tries before they got what they needed. Poor little thing had quite a stressful morning. The good news is that her ANC is up (.4 instead of .3), but with the continuing fevers, they want to keep her admitted for at least one more day. They also changed the antibiotic (from rocephin to metronidazole, plus she's also getting cefepime). Dr. Gold said that if her ANC is still going up tomorrow morning, there's a very good chance we could take her home, even if she's still running. No guarantees though. I guess we'll see which way the wind is blowing tomorrow. I have a prescription for clindamycin for her to take at home. It's oral--thank goodness, because being on IV antibiotics at home would mean inserting another PICC line, and I'm sure we all remember how difficult her last PICC line was. This medicine comes in either a nasty-tasting liquid or a capsule. Now, Sophie is really good at taking pills, but she does not like capsules (maybe the gelatin tastes funny, or it sticks to her tongue a little bit). So we're going to get the capsules, because the doctor says the liquid is about the worst stuff she's ever had in her mouth (they make the doctors taste the medicines they prescribe--a neat idea). I tried to have a rational discussion with Sophie about how much better the capsules will be, but she's not convinced yet. Wish us luck! Elisabeth is doing well, but she's in as much turmoil as we are. She worries about Sophie, and she's also envious of all the attention Sophie is getting. When Sophie is sick like this, I just want to drop everything and be with her constantly, but then I'm really torn because I miss Elisabeth and Randall too. It's really frustrating to have to be separated from each other and that we have such a short time together when we're switching off. It's times like this that living so far away from the hospital is so difficult. I'm very eager for us to be reunited. 1:00 PM: Good news--Sophie is being released today. I've been packed up for nearly two hours, and we're just waiting for the release paperwork to be processed. I don't know exactly what her ANC was today, but apparently it's good enough to get her out of here. The blood draw this morning was pretty traumatic. She was upset about putting the numbing cream on (because she knew what that meant). The place on her hand where the numbing cream was turned out not to work, because the vein was still blown from the day before. So the person drawing the blood decided to prick her finger and squeeze droplets into the vial. That worked just fine, although she was still pretty upset about it. It's hard for me to see her suffer in any way, and when it was over, I told her I was sorry we had to do things like that and that I hate that we have to do things that hurt her. She said, "You're not supposed to say 'hate'" (in our house, we avoid that word, but that is exactly what I meant). I said, "I know, but that's how I feel," and then I got tears in my eyes. She asked me if I was crying, and I said I was, and then her eyes started to water. So, we just held each other cried quietly for a while. She's been unusually loving for the last few days, telling me often how much she loves me, and how I'm her favorite (but then she goes on to list her other favorites, so I can't feel too special!). She slept for several hours after her morning trauma, and I had a nice quiet morning. We're pretty excited about going home, but the waiting is not so fun. She's watching videos, and I might read for a while after I pack up the computer. 4:55PM Well, disregard everything that Susan posted earlier. Apparently, there was a gross and unfortunate miscommunication between the doctors and the nurses at the hospital, and Susan was given the very strong (but inaccurate) impression (several times) that they were clear to go home. As it turns out, Sophie's ANC did not improve over yesterday. In fact, it dropped from yesterday (down to 0.2 from 0.4). That, of course, means that her immune system is not yet gaining strength, so she'll need to stay for at least another night, which means at least another round of trauma with the blood draw and even greater anxiety that the IV she currently has (same one since Saturday night) will not hold out much longer and will need to be moved to another site. She's been stuck so many times in both hands and in her left elbow that I worry they will not be able to find an optimal spot for IVs and blood draws, but they're the experts, I guess. I'm very, very disappointed and frustrated that Sophie is not home yet. Although I understand the medical reasons why she needs to be in the hospital, I'm tired of her being there, I'm tired of our family living separately, and I'm tired of Sophie having to suffer through the needle sticks. I'm totally in a funk as to what I should do tonight (home alone with Elisabeth). I'm in no shape to go anywhere and don't know where I would go if I could--the hospital is too far away. Hopefully, Elisabeth will be cooperative and we'll find a way to entertain ourselves for the evening. She has early release tomorrow, so we'll probably head up around lunch time. Maybe Sophie will come home tomorrow. 11:30 AM: No real news here, although I'm in a much better frame of mind now than I was yesterday, or even early this morning. At least I feel like we're all on the same page now. The phlebotomist came this morning and pricked Sophie's finger for the blood draw. That went pretty well, but unfortunately, the blood clotted before it got to the lab, so they couldn't analyze it. Sophie's nurse and I decided we would try to draw blood out of her IV again so that we could avoid another poke, but that didn't work either. They came back at 11:00 to draw blood from her arm. We had put numbing cream in a couple of places, but the first poke worked (thank goodness!). Then one of the residents stopped by and said she would ask the lab to put a rush on the analysis. Seeing the nice resident really cheered Sophie up after getting poked. Sophie hasn't had any fevers since Monday night, so getting out of here really just depends on whether her ANC has gone up. So, we'll see how things work out over the next few hours. And, of course, finding out we're going home and actualy leaving the hospital are two different things. Sometimes the release paperwork can take hours, so I'm prepared to be here for a while longer. Seeing all those encouraging comments from last night's post was wonderful and made me feel so supported. Thank you for hanging in there with us! 2:30 PM: I just signed the discharge papers! We're packing up and going home. (This time I waited to pack until after I had signed the papers!). Her ANC is up to .4 (from .2), and most of her other counts are on the upswing. Taking the IV out (and removing all the dressing and tape that was holding it in place) was probably worse than doing blood draws. It took two of us to hold her down and another to pull it out. Goodness gracious! Anyhow, I don't want to delay packing any longer, so I'm going to end this, shut down the computer and get moving. Thanks to everyone for your positive thoughts and prayers. 11:00 PM: Just a quick post to say that we all had a happy day at home. Elisabeth actually went to Countryside today (they had space available for elementary-age kids out of school for the winter break). Sophie played and danced all day and seemed to feel well. She coughs sometimes during the night, but she hasn't had any fevers. She doesn't mind taking the antibiotics in capsule form at all (it helps that they are a very pretty bluish green). She's also thrilled to be taking a break from chemo, because it means she doesn't have to stop eating at 7:00 (one of the pills she takes at bedtime has to be taken on an empty stomach). The girls have been so happy to be reunited. They definitely still argue and fight like all sisters, but they are having such a good time. We are all so relieved to be at home together. I can't believe Christmas is only 4 days away. Mom comes tomorrow through Christmas day (not long enough, but we'll take what we can get). 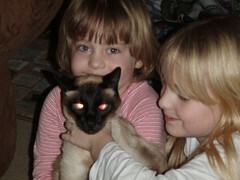 Actually, I think the cats are a little unsettled when our family is in disarray. They much prefer the world to be predictable (don't we all). We are all doing well--when do the girls go back to school? Sophie continues to recover and is doing a great job taking her antibiotics (super-large capsules) three times a day. She has a hacking cough, but we suspect that she is developing asthma (Susan has asthma). Compared to leukemia and chemotherapy, asthma seems totally manageable, though! We are looking forward to a wonderful family Christmas, and we hope Christmas is a meaningful and blessed event for everyone we know and love. 7:38 PM Two-point-four. That's Sophie's Absolute Neutrophil Count (ANC) from today. For those of you who have been keeping track, the ANC is how we monitor Sophie's immune system. Since the chemotherapy destroys all rapidly-dividing cells, the immune system is a necessary but unfortunate victim of "collateral damage" from the treatment. Sophie's recent hospital stay was due to a very weakened immune system, and we were sent home under orders to stop all chemotherapy. After a week of no drugs, other than her antibiotics, Sophie's ANC has gone from 0.4 to 2.4. That's a rocket increase, and is reflected in all her other blood counts (platelets, hemoglobin, hematocrit, etc.). It's hard to believe that those itty-bitty pills that we give Sophie on a regular basis can so dramatically weaken her immune system, but, apparently, they do. We've been wondering lately what our life post-treatment would be like, I guess we caught a glimpse today--strong, healthy, "normal" immune system. Granted, getting to the point where we found out how well her blood counts are doing was no picnic. All four of us went to UNC today for Sophie's blood draw. Sophie was fine with everything until we got to the clinic, then she was very distraught as I dropped Susan and Sophie off--she thought Elisabeth was not going to the clinic with her and she really, really wanted Elisabeth with her. After we assured her that we were just going to park the car and would all be together in the clinic, all seemed well with her world. When the time came for the "poke," Elisabeth stood with me in the doorway as Susan held Sophie in her lap. Elisabeth was very, very curious, but really, really did not want to see or hear Sophie getting stuck. We sat together in a chair just outside the treatment room as Sophie SCREAMED BLOODY MURDER for several long, agonizing minutes. Sophie kept screaming that she wanted it "fast," but was absolutely refusing to hold her hand down (logic seems to not work when you're scared and screaming your head off). In the end, there was only one stick (hooray), and Sophie recovered. She was not the only child in the clinic screaming--there seemed to be several today. One of the parents was asking if there was torture going on, and I imagine that's exactly what the old torture chambers sounded like--horrifying, and even more so when it's your own child screaming, "NO, WAIT, I'M NOT READY YET!" I reminded Elisabeth (and myself) that we get to do this many, many times over the next several months and even beyond Sophie's treatment, so I hope and pray that this, too, will become something that she finds a way to deal with and "normalize." 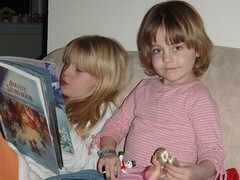 Elisabeth and Sophie reading our Advent book this year. 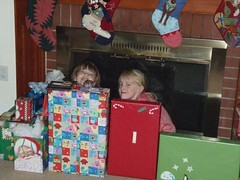 Barricading themselves next to the fireplace on Christmas Eve. Surprisingly, we did not let them keep their little "fort" up throughout the night! 9:45 PM: Sophie is feeling so much better (and had a great day at Countryside today), but now Elisabeth and Randall are getting sick. Elisabeth has it the worst, and we suspect it's the flu. Sophie got a flu shot, but the three of us never got around to getting one this year, and we may really come to regret that. Poor Elisabeth had a fever of 103.2 a little while ago, so we gave her some ibuprofin (acetominaphin hasn't seemed to do much for her today), and she's been sleeping since then. She's clearly really miserable and uncomfortable, and I hate to see her suffering. As much as we don't like having to take Sophie to the ER when she has a fever, there's a real comfort in having the power to do something about her fevers. To know that doctors have it under control and are running tests and will figure out what's causing the fever and make it go away. There's no one we can call this time of night for Elisabeth, and it makes me feel really powerless. At least tomorrow is Saturday, so I can be home to take care of her (and Randall if he is headed for the same thing the way he thinks he is). And we will be doing lots of hand washing around here. Although Sophie's counts are up, she's back on chemo, so they'll be coming down, and we really don't want her getting this and landing back in the hospital.